This is the button pack that contains all of the hand dyed buttons used to embellish block 2. 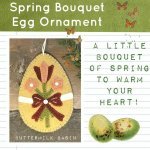 More details available under "Spring Has Sprung" Block of the Week tab. 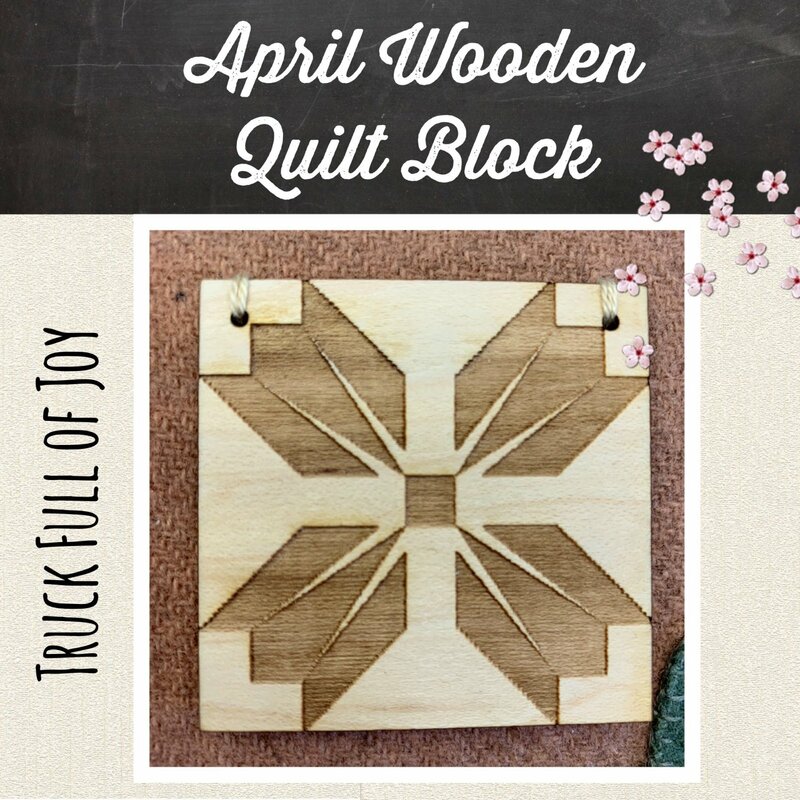 Here is block 2 of the Spring Has Sprung block of the week! The kit includes the pattern, wool and fabric background for block 1. 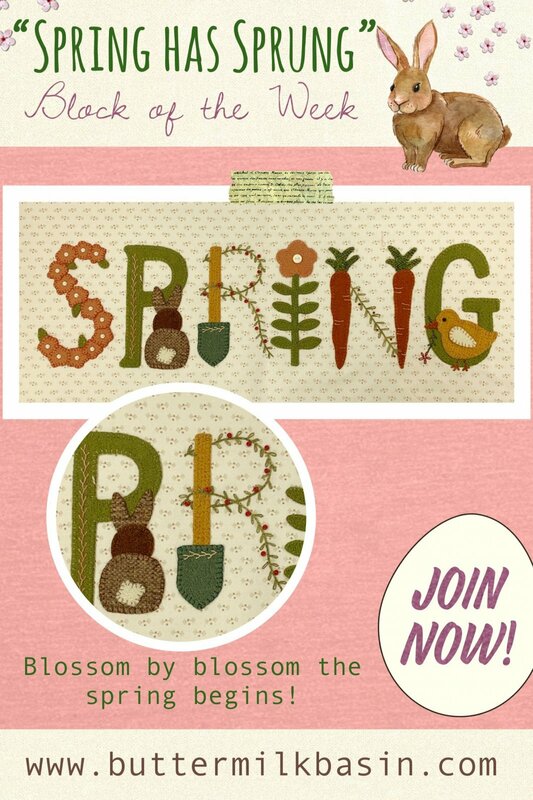 More details available under "Spring Has Sprung" Block of the Week tab. This is the button pack for block #3, that contains all of the hand dyed buttons to embellish block 3. This is block 3 of the Spring Has Sprung block of the week. The kit includes the pattern, wool and fabric background for block 3. 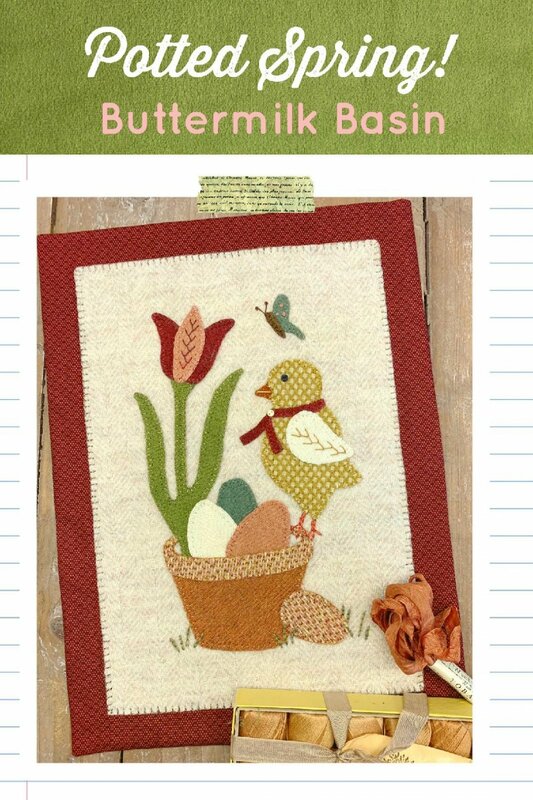 More details available under "Spring Has Sprung" Block of the Week tab. This is block 4 and 5 of the Spring Has Sprung block of the week. The kit includes the pattern, wool and fabric background for blocks 4 and 5. 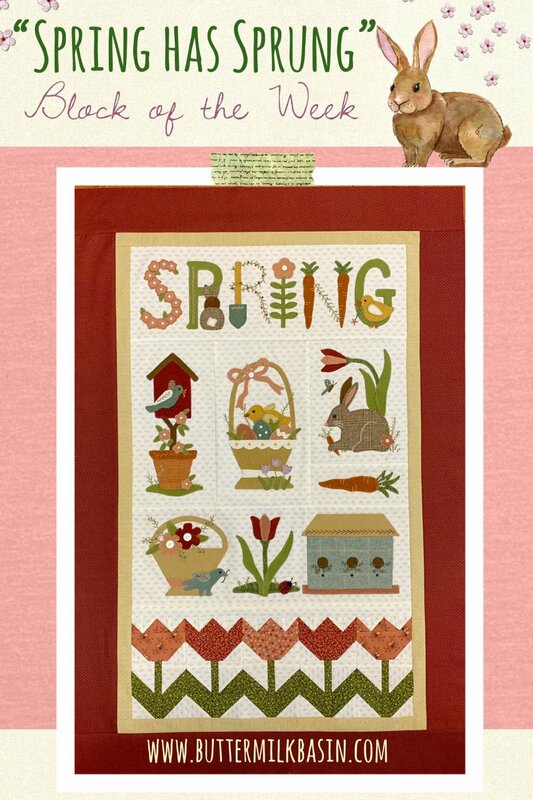 More details available under "Spring Has Sprung" Block of the Week tab. 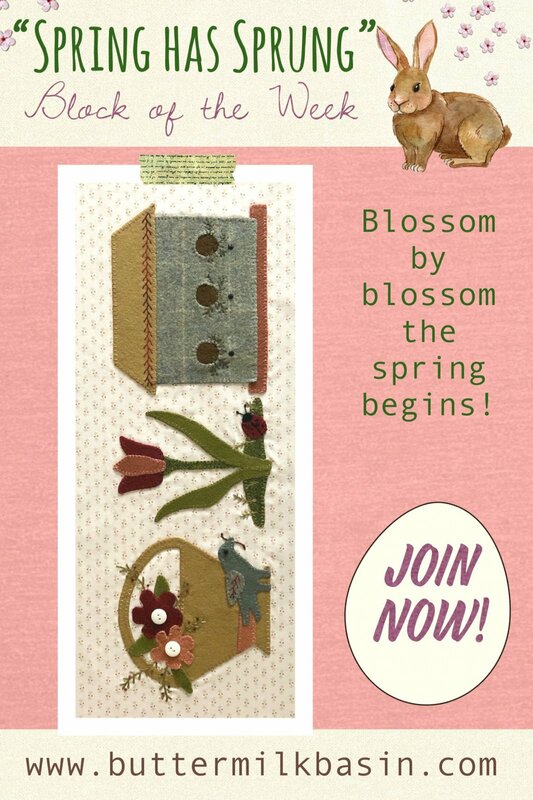 This is the button pack for block #6 of Spring Has Sprung! It contains all of the hand dyed buttons used to embellish this block. This is block 6 of the Spring Has Sprung block of the week. 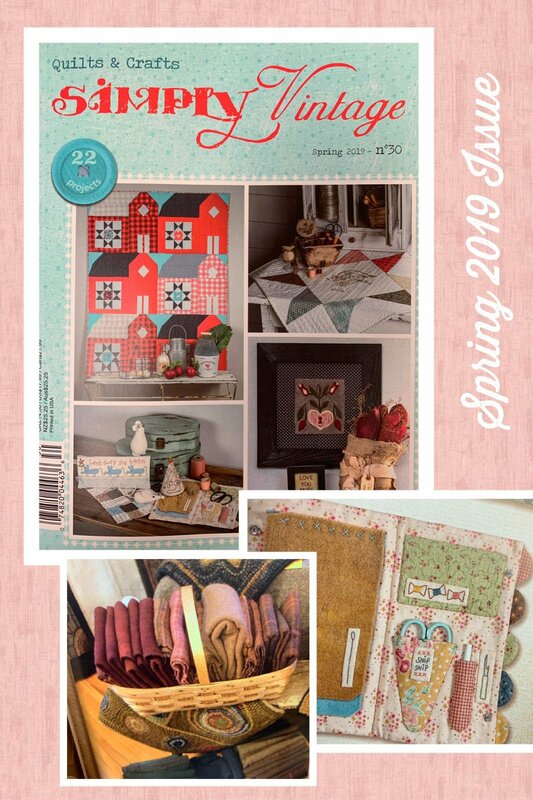 The kit includes the pattern, wool and fabric background for block 6. 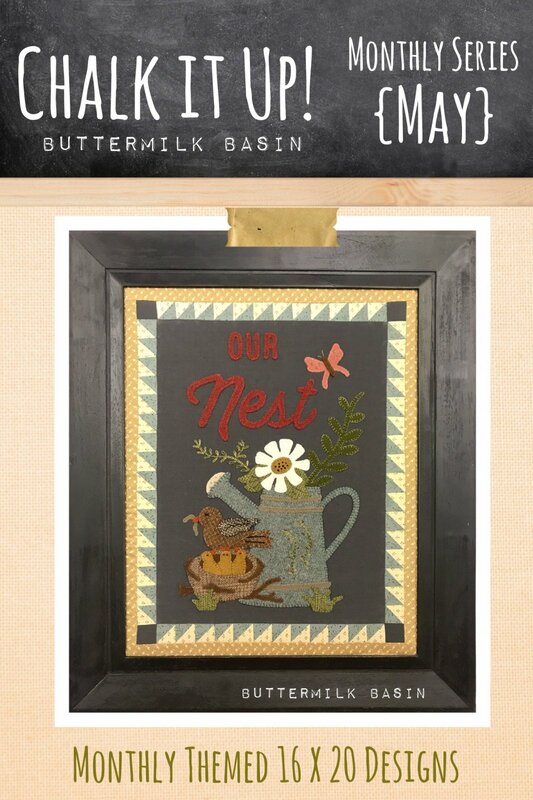 More details available under "Spring Has Sprung" Block of the Week tab. 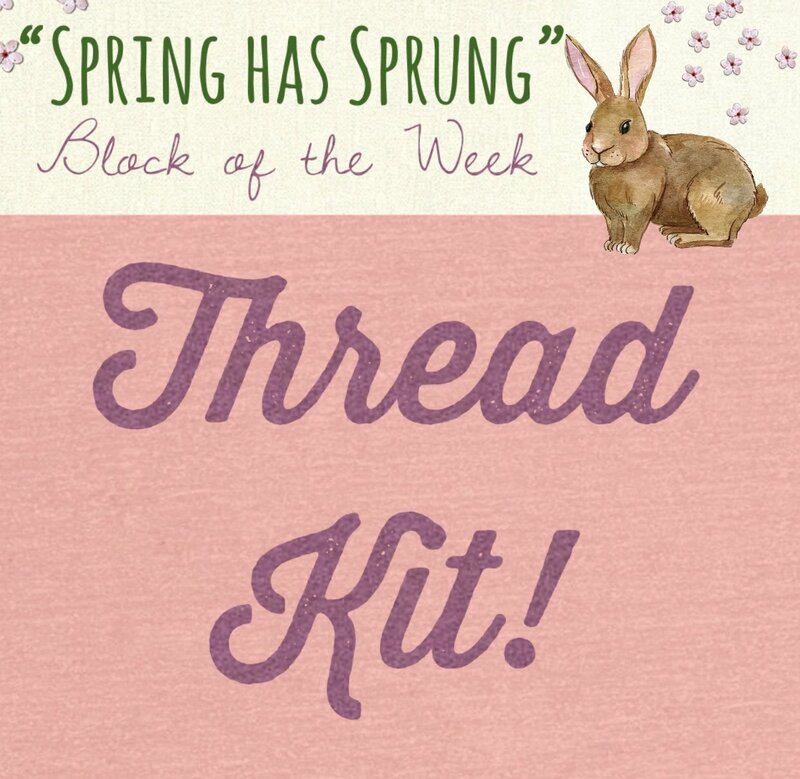 Here is the thread kit for the "Spring Has Sprung" block of the week. The thread kit contains 10 flosses and pearl cottons that will be used on this quilt. 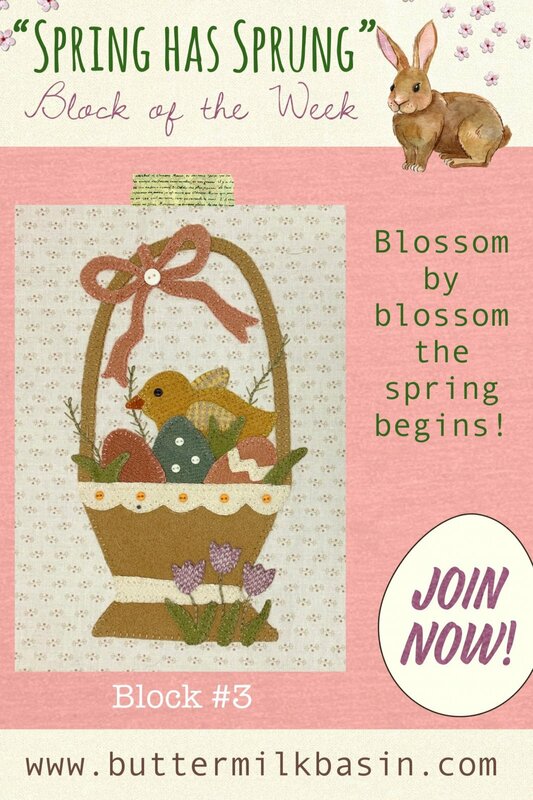 More details available under "Spring Has Sprung" Block of the Week tab. The "Spring Has Sprung" block of the week is complete! This quilt is darling! 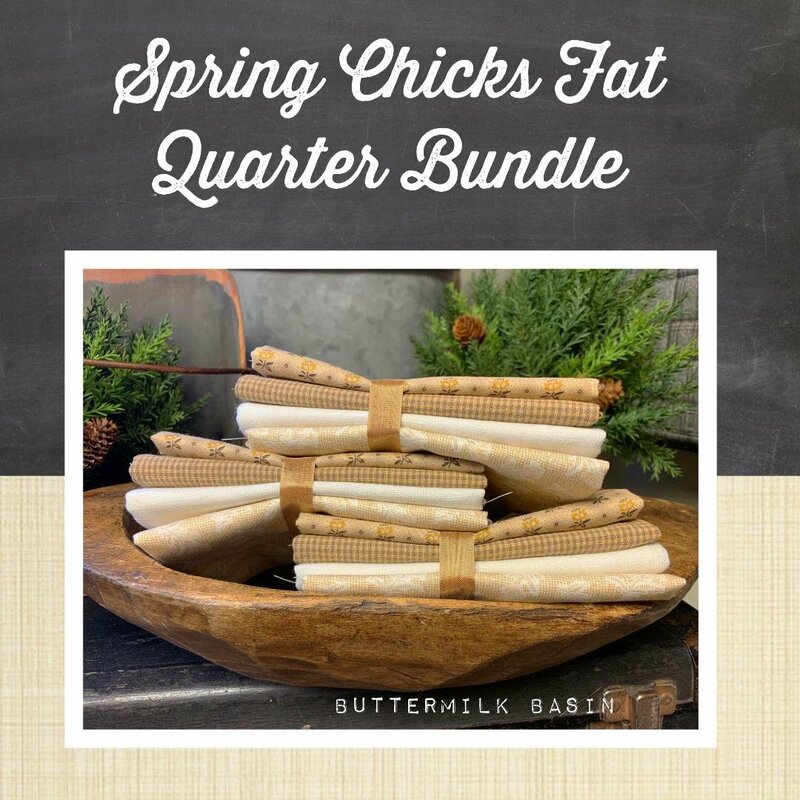 It is 28.5 x 41.5.The finishing kit contains the fabric to make the row of tulips at the bottom, the inner border, outer border and binding. 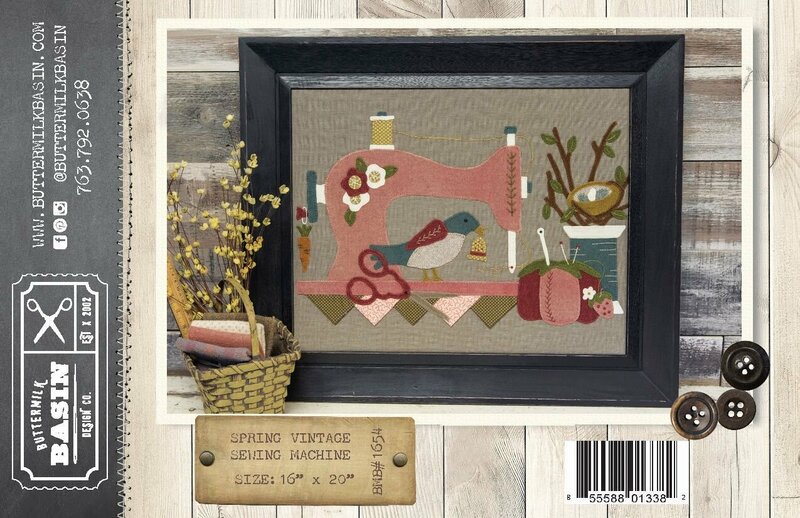 Order this great magazine from us - it is full of spring projects in wool and fabric, and much more! Potted Spring! 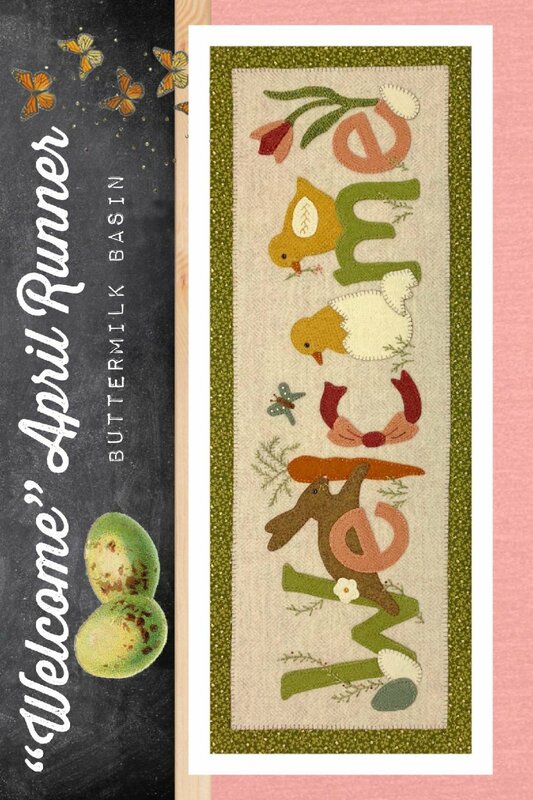 is wool applique on a wool background, then attached to a fabric background! It measures 9 1/2" x 12" when finished. The kit includes the pattern, wool and fabric. 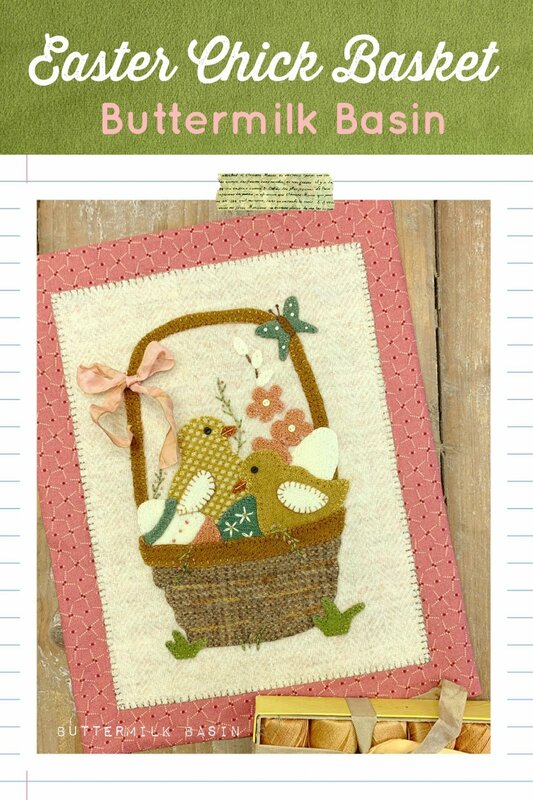 This adorable Easter Chick Basket is wool applique on a wool background, then attached to a fabric background! It measures 9 1/4" x 11 3/4" when finished. The kit includes the pattern, wool and fabric. 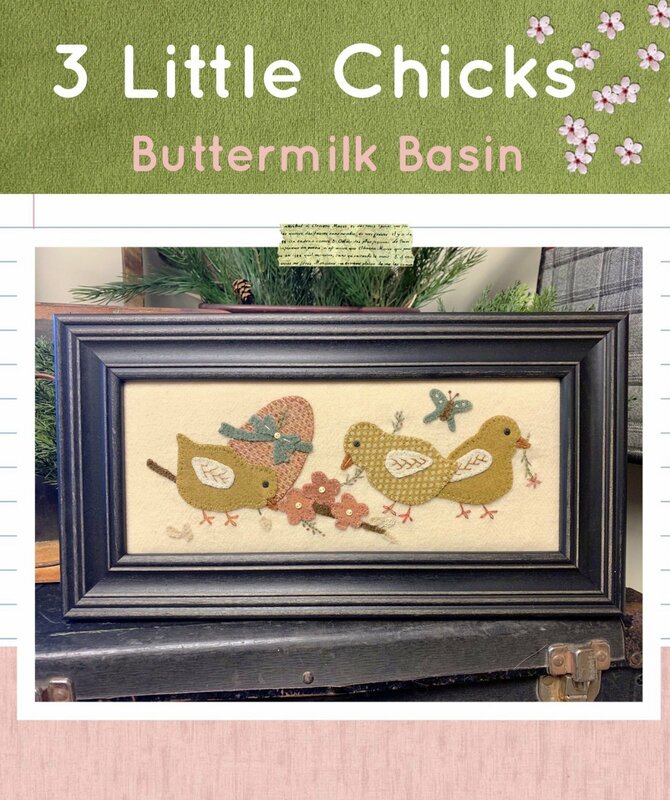 3 Little Chicks is the perfect framed project to display this spring! The project is 4 1/2" x 11 1/2" inside the frame. The kit includes the pattern and wool to complete the project. Frame sold separately. This is block 1 of the Spring Has Sprung block of the week. The kit includes the pattern, wool and fabric background for block 1. 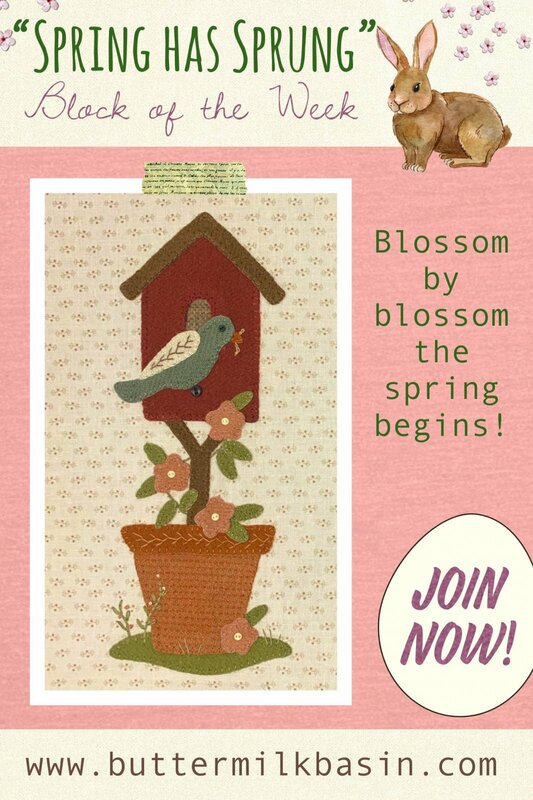 More details available under "Spring Has Sprung" Block of the Week tab. This is the button pack for block #1, that contains all of the hand dyed buttons to embellish block 1. 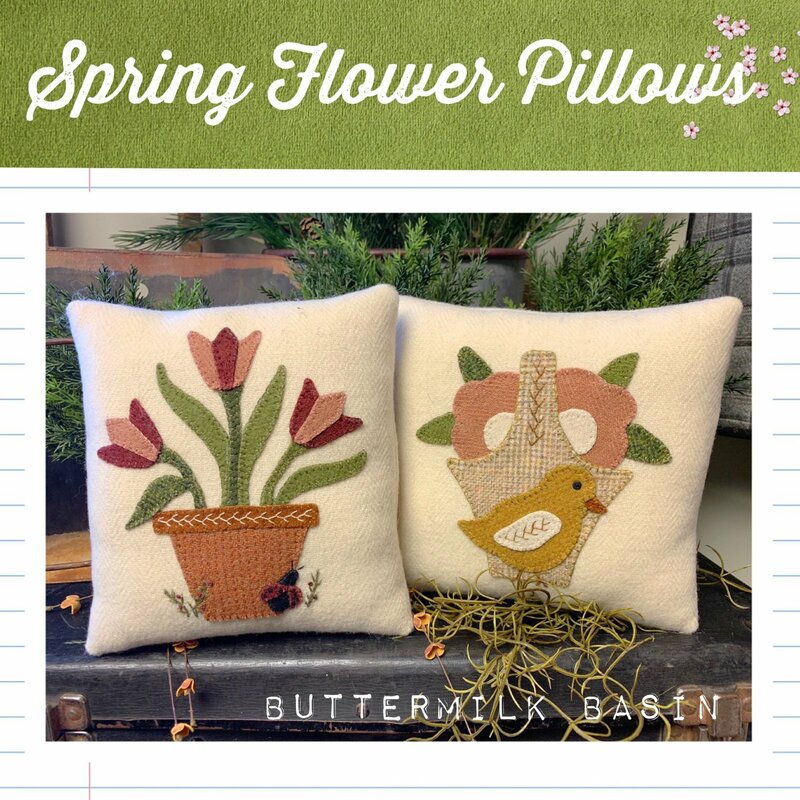 The 3 Springtime Pillows are nice projects to stitch up in time to decorate this spring! 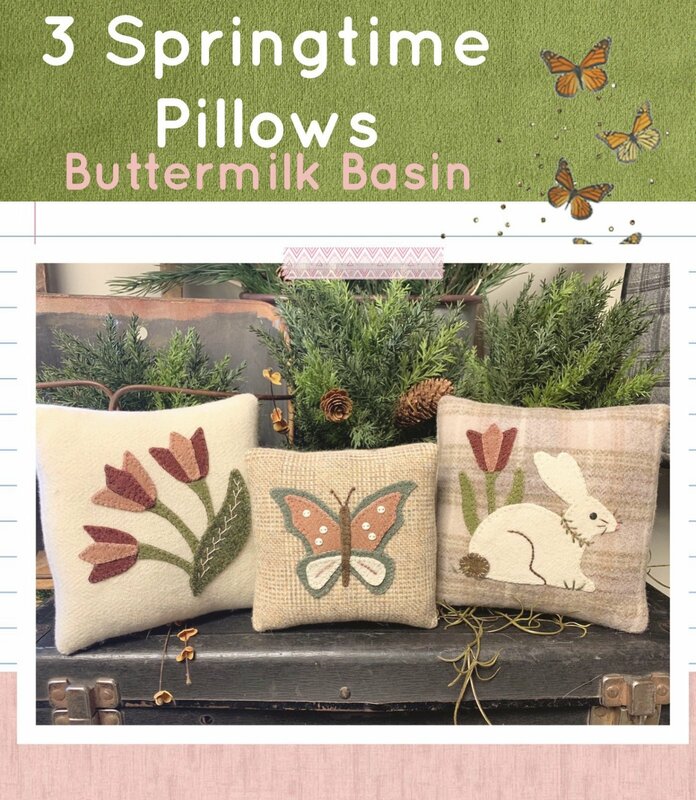 2 of the pillows are 6 x 6, and one is 5 x 5, perfect sizes for a basket or bowl! 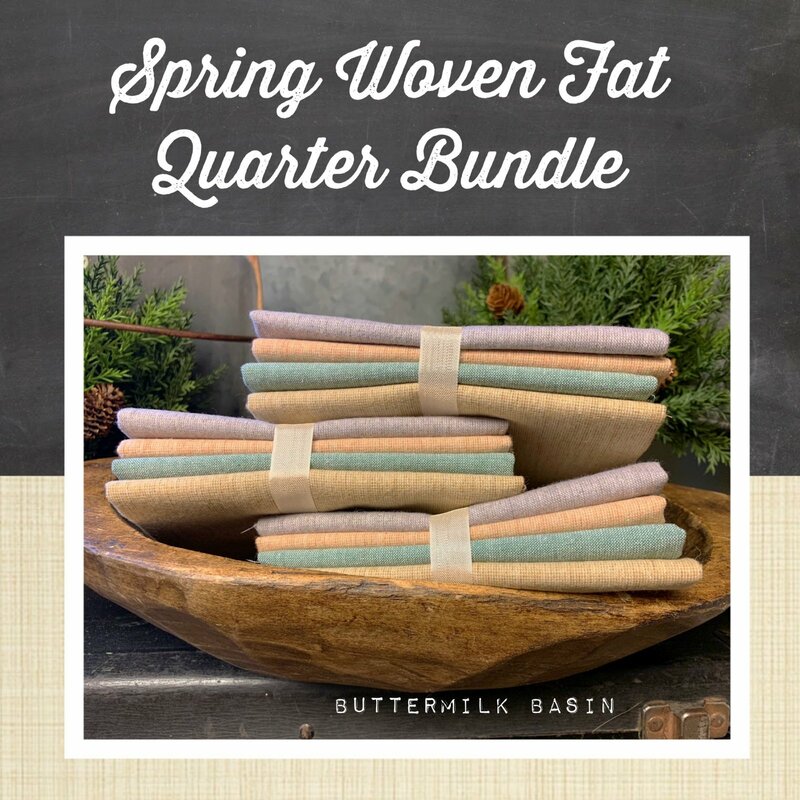 The kit includes pattern, wool and flannel backing. This lovely ornament is wool applique and measures 3 1/4" x 4 1/2". The kit includes the pattern, wool, buttons and twine. 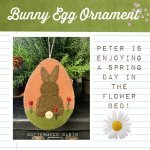 This adorable bunny ornament is wool applique and measures 3 1/4" x 4 1/2". The kit includes the pattern, wool, buttons and twine. 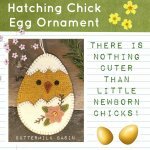 This cute chick ornament is wool applique and measures 3 1/4" x 4 1/2". 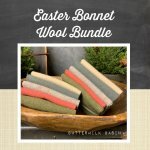 The kit includes the pattern, wool, buttons and twine. 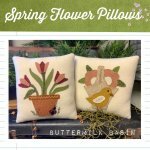 These 2 beautiful pillows are wool applique on wool, measuring 7" x 7 3/4" and 7 1/2" x 7 1/2". 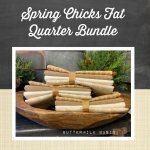 Tuck them in a bowl of spring greens or display them on a shelf! The kit includes pattern, wool and flannel backing. 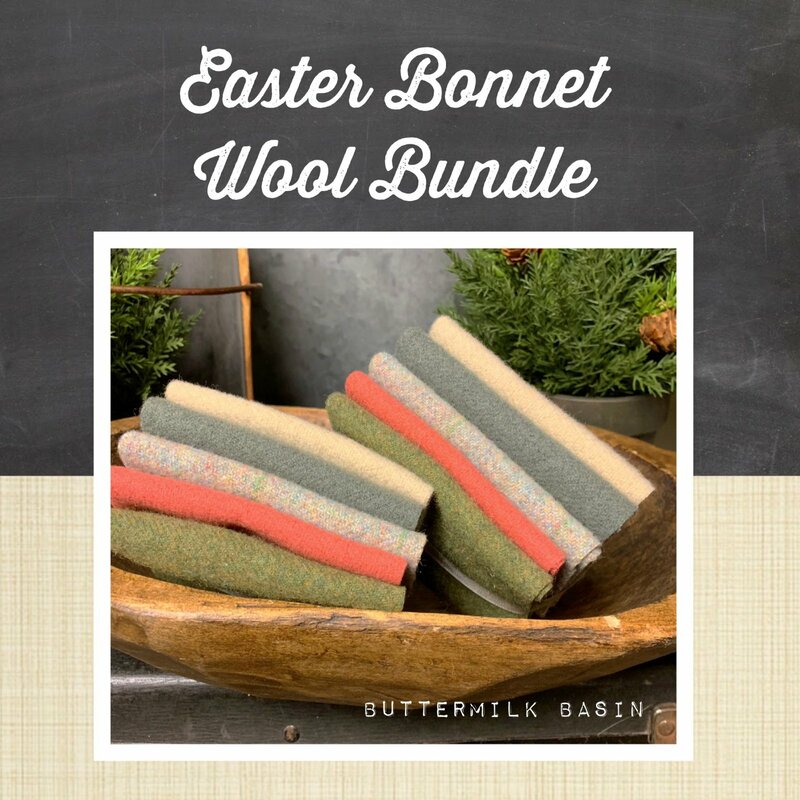 The Easter Bonnet wool bundle is (5) 8" x 8" pieces of beautiful wool to use in your projects! 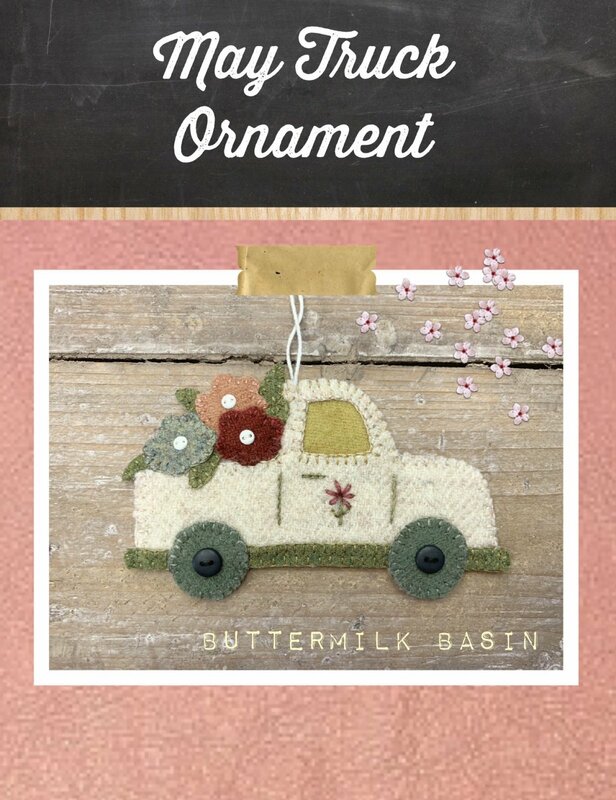 Vintage Truck Ornaments Thru the Seasons! This adorable ornament is 3.5" x 5.5". 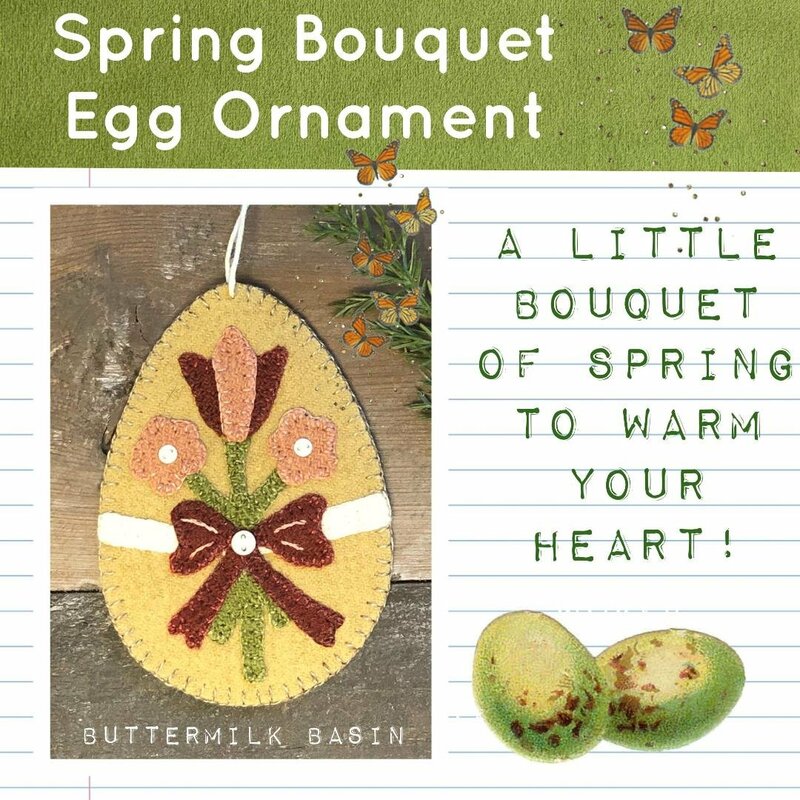 The kit includes pattern, wool, backing, buttons, and string to hang. 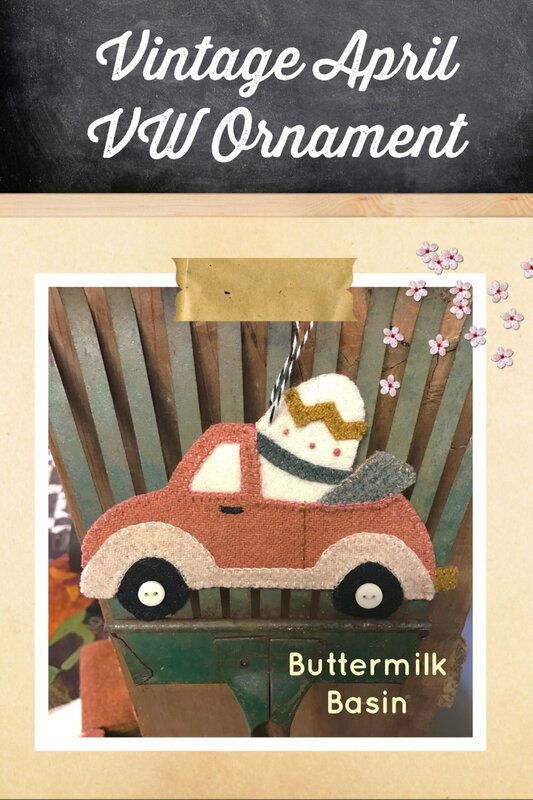 Buttermilk Basin's Vintage Volkswagen Ornaments Thru the Seasons! 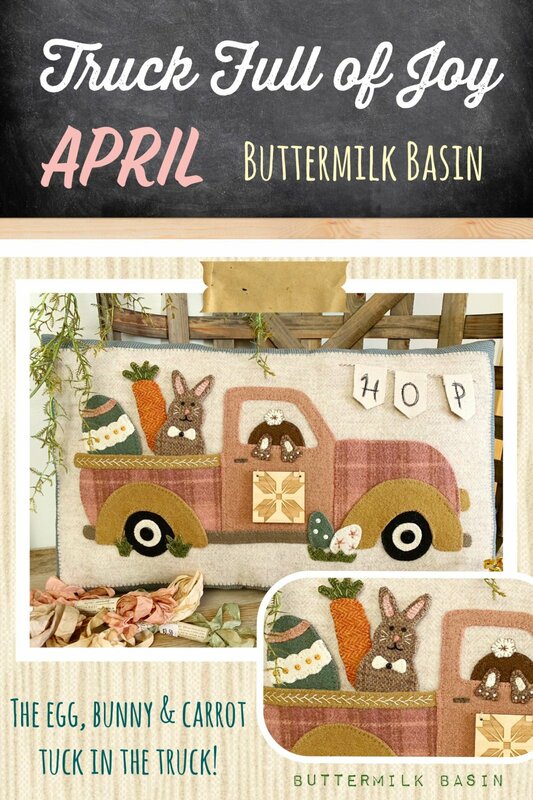 April's VW has it's top down for spring and is carrying a cute egg! The ornament is 4.5" x 5.5" and the kit includes pattern, wool, buttons, and string to hang. 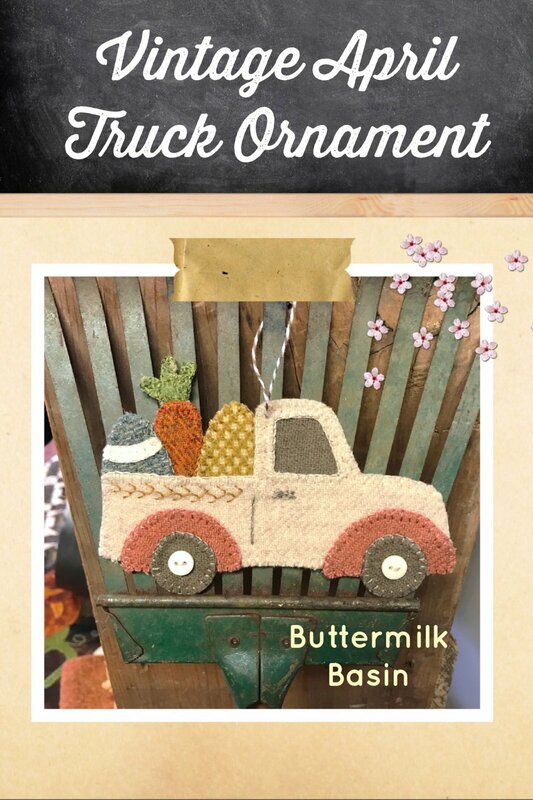 The sweet little May truck ornament is hauling around a load of flowers! This adorable ornament is 3.5" x 5.5". 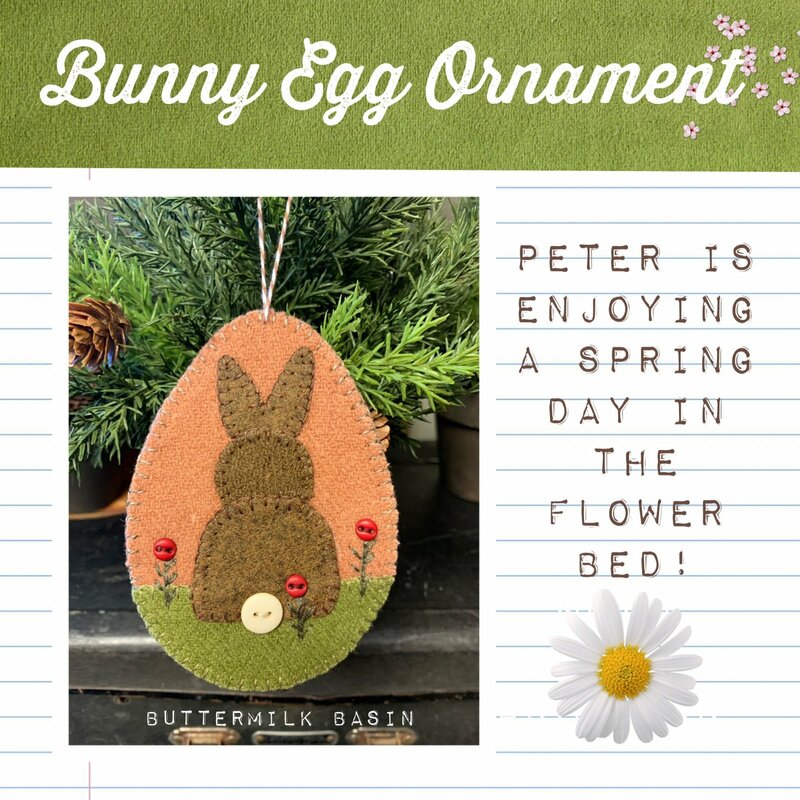 The kit includes pattern, wool, backing, buttons, and string to hang. 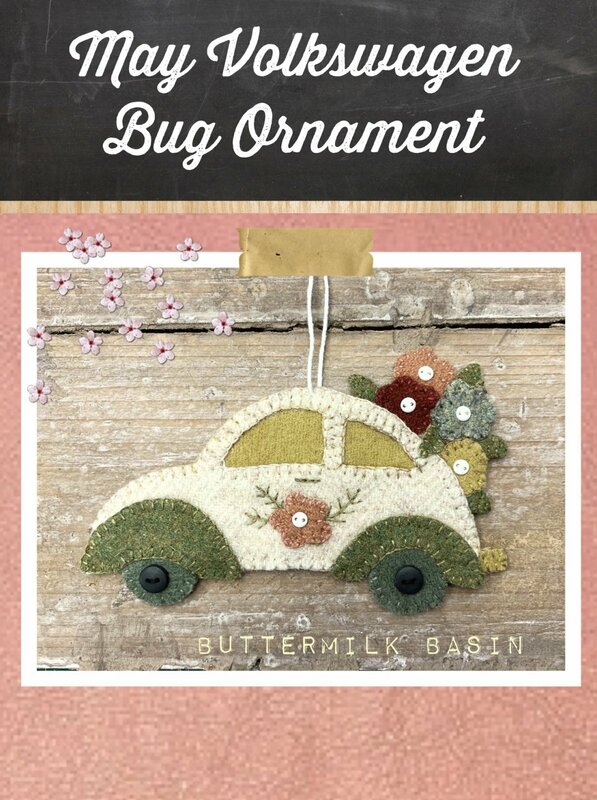 The sweet little May VW ornament is bursting with flowers! The ornament is 4.5" x 5.5" and the kit includes pattern, wool, buttons, and string to hang. 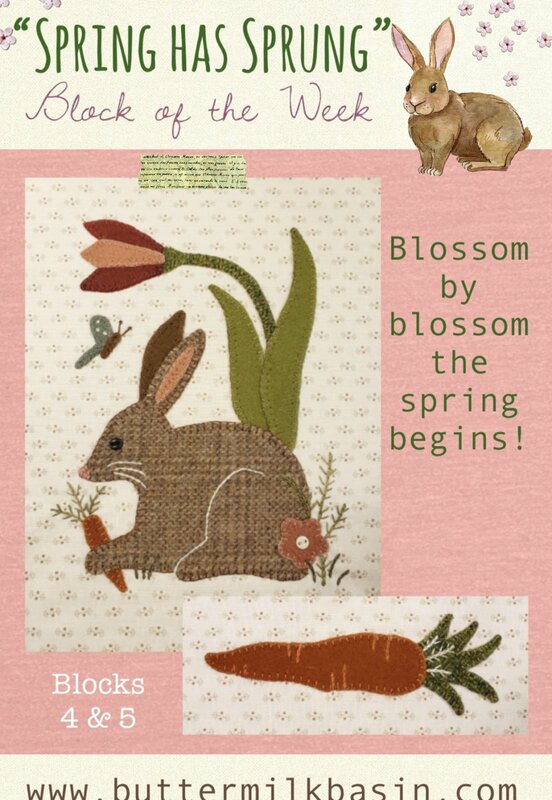 This 11 X 11 monthly "themed" APRIL mat features a cute bunny with a bow and the first sign of spring - a lovely tulip! Kit includes wool & pattern. 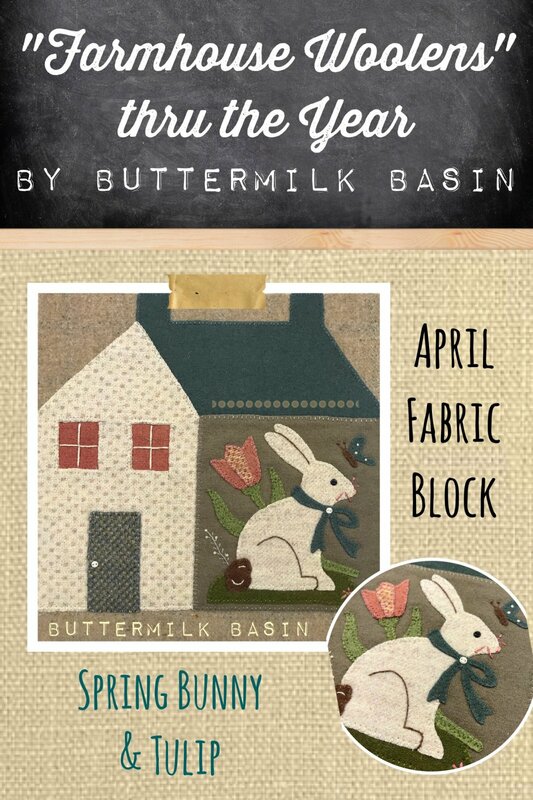 This 11 X 11 monthly "themed" APRIL block features a cute bunny with a bow and the first sign of spring - a lovely tulip!! 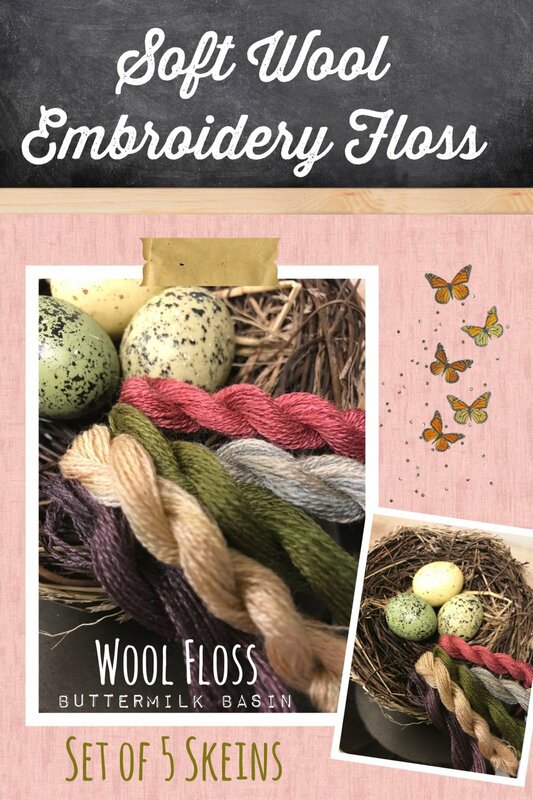 Kit includes wool, fabric & pattern.